A strong family may be as small as two people or as large as a kinship network of grandparents, aunts, uncles, and cousins. The size of the family, indeed the composition of the family, does not matter as much as the feeling of belonging and the sense of sustenance that emerges from living with stable familial support. People seem to do better in life when they have the feeling of belonging to something larger, and stronger, than they are individually. A familial network diminishes the uncertainties that derive from the stresses of everyday living. The family has undergone many changes over recent decades, due mainly to major social and cultural upheavals. When life was mainly agriculturally-based or when immigrants came to a new land, the traditional family was able to thrive. We looked to our kin for support and they were there for us. The decades since the middle of the twentieth century have seen a steady unraveling of this bygone ideal. It is difficult to describe precisely what caused this change. It may have been such factors as government programs (the government, rather than children, could take care of people when they grew old). Or the automobile and modern roads (people were no longer confined to one location any longer – family members could move away). Or was it television? Computers and electronic data transmission? Improved communication technology? The high divorce rate? What we do know is that families today find it more difficult, due to competing demands from the larger world, to spend time together, to feel committed to each other, to communicate with each other, to share spiritual values, and to cope with crises together. Some families, however, seem to have overcome these threats to a strong and thriving family life. .
A commitment is a pledge or a promise. Applied to family life, it is a sense of responsibility or duty to the family that overrides temporary conflicts or times of crisis. Members of strong families take their familial commitment seriously. It is conscious, unwavering, and unconditional. Strong families are not immune to the problems faced by everyone else in modern times – they too face hectic days, financial difficulties, demanding work hours, marital infidelity, and illness. In strong families, however, commitment implies that family members help each other out during hard times. They make the family relationship a priority, even if it means sacrificing personal wants, activities outside of the family, or work demands. At the core of sacrificing for the family is the idea of putting the interests of others ahead of one’s own – a notion that reflects moral values and integrity. __ Arrange a family council for an hour once a month. Discuss your family goals, what you are doing to meet them, and what needs to be worked on. Listen to each other’s ideas rather than condemning them. Encourage free, open, and accepting communication. __ If everyone in the family is too busy with outside activities, rearrange schedules so that more time can be spent together with the family. Or have each family member agree to give up one outside activity. __ Designate a wall in the house as the “family wall.” Decorate it with photos, souvenirs, and family mementos. __ Make a record of the family history in a photo album, identifying dates, places, and special events. Healthy families share in common the ability to show appreciation to each other. By showing appreciation, we are essentially saying that the other person is worthy and has dignity. We declare that we can see the positive qualities of the other person. This message is crucial to emotional wellness because it is a core building block of self-esteem. Thus, strong families help build healthy personalities. Parents and siblings have a strong influence in molding children to see themselves as either good or bad. When a person’s self-definition is characterized by negative self-esteem, that person has difficulty both in acknowledging positive feedback and in giving it. Strong families cherish their members, show that they are valued, and build self-esteem in their members that can be carried on to the next generation. __ Set a goal of giving each family member at least one compliment per day. __ Create a positive home environment by reframing negative statements into positive ones (instead of saying, “You are always trying to control me,” say “I like how you are concerned about my well-being all the time”). __ Write down ten things you like about each member of your family – and then show them your list. One research study has shown that the average couple spends seventeen minutes per week in conversation. In contrast, strong families spend a great deal of time talking with one another – ranging from trivial matters to important issues. Communication helps us to feel connected, and because members of strong families feel free to exchange information and ideas, they become good problem solvers. Some families set aside time for family council meetings and others do their talking over the dinner table each night. Most communication in these families, however, is spontaneous. Positive communication involves both talking and listening. __ Designate a time for the family to share the events of the day (for example, at dinner). Avoid disciplining and negative remarks during this time. __ Look objectively at your communication patterns and determine which ones can be improved (for example, using sarcasm, creating crises, cutting off someone else who is speaking). Work on one communication habit for a month. Then, the next month, work on another. A trained therapist can help identify negative communication patterns. Strong families spend a great deal of time together, and the time spent is not always in planned events. Just spending time, doing nothing in particular, eases our feelings of isolation and loneliness, builds relationships, contributes to a feeling of security, and helps to create a sense of family identity. Individual family members should find time when two people can do something together without the entire family present. Spending time together can involve eating meals together, doing household chores together, celebrating special events and holidays, and participating in community activities, indoor recreation (playing games, telling stories, working on puzzles) or outdoor activities (taking a walk, camping, picnicking). __ Recall some of your happiest childhood experiences which involve spending time with your family. Try to recreate these types of experiences with your current family. __ Let the children help with household tasks, and do these chores together as a family. __ Plan a yearly family reunion – and make it easy for everyone to attend. __ Find a cause that is bigger than you or your family (world hunger, peace, reducing crime, helping the homeless). Volunteer your time as a family on these issues within the community. __ Take a look at your own values and views about the world. Keep a journal of your thoughts and share them with your family. __ Set aside family time for a form of devotion that is compatible with your beliefs. This could include prayer, meditation, contemplation, or a walk in nature. A crisis is a time of decision, the outcome of which may be positive or negative. Some families fall apart when faced with a crisis like illness, death, or financial setbacks. All families experience the challenge of a crisis at certain times. 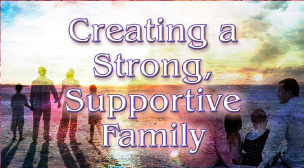 Strong families, however, have the ability to pull together and draw on each other’s strengths when they are faced with the stress of crisis. They pool their resources, work together, get help from outside support systems, keep communication open in the face of the strong emotions of a crisis, and draw on their shared spiritual beliefs. When a family is strong, it is able to maintain the flexibility necessary to weather the crisis, and family members expect a positive resolution in the end. __ Include in family discussions at dinner hypothetical questions involving crises (like what you would do in case of an earthquake or a hurricane, or if a parent became ill, or if there were a national emergency such as war). Use discretion in talking about these topics with young children, who may be frightened by these discussions – but they can learn that if their parents can handle these situations, so can they. __ Examine the level of stress experienced by family members and use stress reduction techniques for managing it (like exercise, cultivating a hobby, talking about stressors). Some people believe that their families are too troubled to change. They feel that their families bring out the worst in each other and that they are plagued with insurmountable problems. They feel hopeless about changing their family life. However, many strong families have emerged from this place of despair, often in the face of a family crisis, to achieve a quality of strength, support, and vitality that they never thought would be possible. People can learn from their failures. It may take the trained eye of a professional therapist to help a family move from this feeling of failure to one of success. An outsider can often observe patterns that family members themselves are not able to see. The support of a therapist can lead a family, one step at a time, through the process of identifying problems, developing strategies for dealing with each problem, and then following through. Even the most troubled families can grow with this type of support. A family has everything to gain by deciding to work on building its strength. Home should be a vital, secure, and enhancing place – where comfort and support reside. Look at the strengths your family already has. Each member of the family can identify positive qualities that exist in even the most troubled of households. Let each person in the family discuss these strong points without condemnation. Visualize what you would like your family to become. Let each family member make up a “wish list” of things they would like to see in the family. Discuss these points and let the feedback be warm and accepting. Identify specific goals. Each family member should come up with a list of specific goals that they would like to see the family aim toward. These should be things can be accomplished (like going to a movie together or having dinner together every night). Then agree on five of the most important goals and put a date beside each goal. Put people in charge of each of the goals. One person will be responsible for ensuring that his or her assigned goal is accomplished by the agreed upon date. Understand that this is only the beginning. Strengthening a family takes time. It is a process, not a one-time event. And we take it step by step.